This photo was taken from the observation deck of the 210-meter tall Tour Montparnasse. 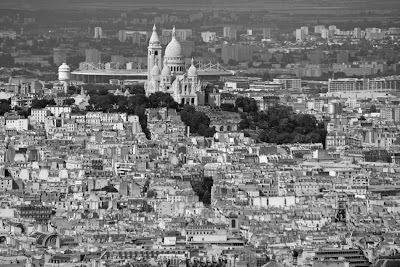 It shows Montmartre, a hill (the butte Montmartre) which is 130 metres high, giving its name to the surrounding district, in the north of Paris. Montmartre is primarily known for the white-domed Basilique du Sacré-Cœur on its summit and as a nightclub district. 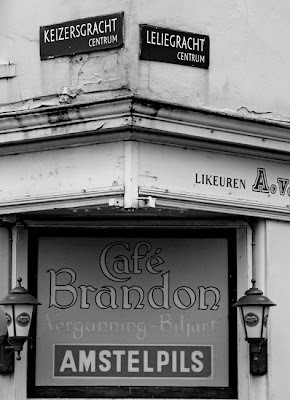 Many artists had studios or worked around the community of Montmartre such as Salvador Dalí, Modigliani, Claude Monnet, Pablo Picasso and Vincent van Gogh. The toponym Mons Martis ("Mount of Mars") survived into Merovingian times, Christianised as Montmartre, signifying 'mountain of the martyr'; it owes this name to the martyrdom of Saint Denis, who was decapitated on the hill around 250 AD. Saint Denis was the Bishop of Paris and the patron saint of France. The hill's religious symbolism is thought to be even older, as it has been suggested as a likely druidic holy place because it is one of the the highest point in the area. The perspective from the Tour Montparnasse is quite unique, as Montmartre is on the same axe as the Stade de France, located 5 km further north in Saint-Denis, in the inner surburb of Paris. The Stade de France is of course the national stadium of France (capacity around 80.000), built for the 1998 FIFA World Cup. 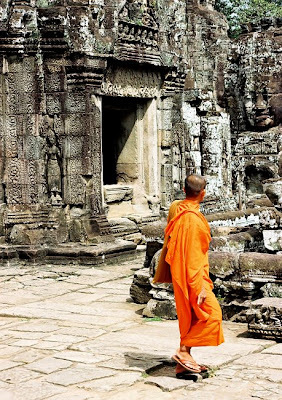 Monk in saffron robe in Angkor, Cambodia. A more seriously treated cliché than a previous post on the subject... You can also look at my Cambodia floder. 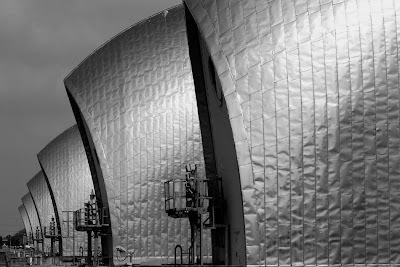 This is the first of a series of photos taken at the Thames barrier. The Thames barrier is a flood control structure on the River Thames, constructed between 1974 and 1984 at Woolwich Reach, and first used defensively in 1983. It has been used over 100 times defensively, the last of which was on March 19, 2007. It is the world's second largest movable flood barrier (the largest is the Maeslantkering in The Netherlands). Located downstream of central London, the barrier's purpose is to prevent London being flooded by an exceptionally high tide moving up from the sea, exacerbated by a storm surge. Built across a 523 metre wide stretch of the river, the barrier divides the river into four 61m and two 31m navigable spans and four smaller non-navigable channels between nine concrete piers and two abutments . In 2005, a suggestion was made public that it might become necessary to supersede the Thames Barrier with a much more ambitious 16 km long barrier across the Thames Estuary. 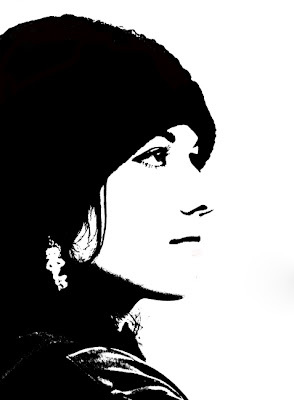 This is a photo taken in the Tuileries Garden, Paris. When the large empty space between the northern and southern wings of the Louvre now familiar to modern visitors was revealed in 1883 (demolition of the ruins of the Tuileries Palace, destroyed in the 1871 fire by the Commune de Paris), for the first time the Louvre courtyard opened into an unbroken Axe historique. 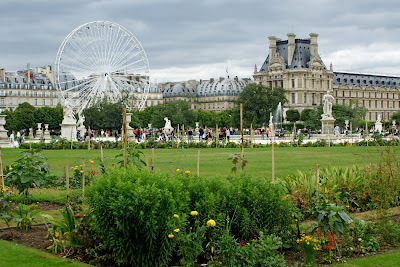 The Tuileries Garden (Jardin des Tuileries) is surrounded by the Louvre (to the east), the Seine (to the south), the Place de la Concorde (to the west) and the Rue de Rivoli (to the north). The Tuileries Garden covers about 63 acres (25 hectares) and still closely follows a design laid out by landscape architect André Le Nôtre in 1664. His spacious formal garden plan drew out the perspective from the reflecting pools one to the other in an unbroken vista along a central axis from the west façade, which has been extended as the Axe historique. 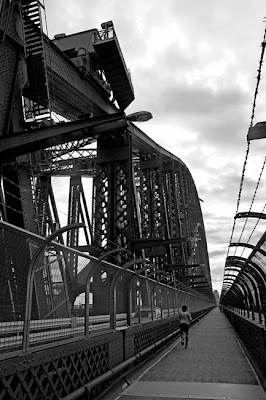 These two photos were taken in Sydney, Australia, and are showing Harbour Bridge, a steel arch bridge across Sydney Harbour that carries rail, vehicular and pedestrian traffic between the Sydney central business district (CBD) and the North Shore. The dramatic view of the bridge, the harbour, and the nearby Opera House is an iconic image of both Sydney and Australia. The bridge is locally nicknamed The Coathanger because of its arch-based design, although this usage is less prevalent than it once was.The bridge was designed and built by Dorman Long and Co Ltd and was the city's tallest structure until 1967. It is the world's widest long-span bridge and its tallest steel arch bridge, measuring 134 metres from top to water level. It is also the fourth-longest spanning-arch bridge in the world. See also previous post on Harbour Bridge Climb. "Smoking has been banned on the streets of Tokyo's Chiyoda Ward since October 2002. Ward employees patrol the streets and fine violators ¥2000. 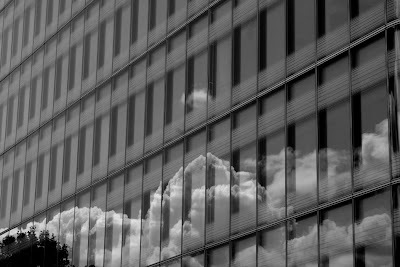 According to the cigarette company Japan Tobacco, Inc., 60 municipalities, whose residents comprise 10% of Japan's population, have regulations to ban or discourage smoking on the street. Only three municipalities assess fines for violations. In April 2007 the City of Burbank, California joined Calabasas and Santa Monica in restricting smoking in public places. The Secondhand Smoke Control Ordinance was supported by Mayor Todd Campbell, Jef Vander Borght and Marsha Ramos following independent requests by 2 Burbank residents, Eric Michael Cap & Robert Phipps Esq. 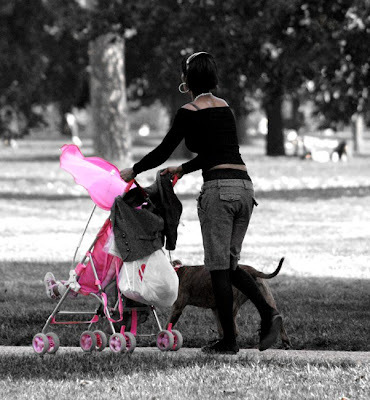 In May, 2007 the City of Beverly Hills voted to ban smoking in all outdoor dining areas, effective October 1, 2007. Numerous other cities have since initiated their own public smoking restrictions, including Baldwin Park, Belmont and South Pasadena. The City of Los Angeles has banned smoking in its Parks following the 2007 Griffith Park fire, started by a smoker. In February 2008, the Hawaii County Council voted to ban smoking at county recreation facilities on the island of Hawaii. Mayor Harry Kim expressed concerns over the bill's failure to allow designated smoking areas, and ultimately vetoed the bill. 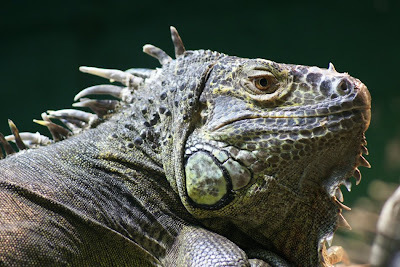 On April 22, 2008, the Council overrode his veto by a 7-2 vote, and smoking was banned in all county recreation facilities, including beach parks, rodeo arenas and the Hilo drag strip." 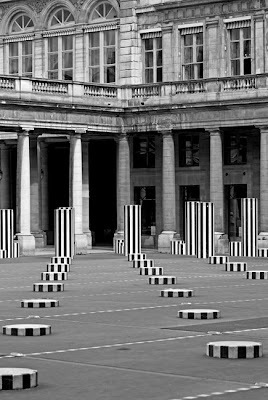 These two photos were taken in the courtyard of the Palais Royal in Paris, and are showing "Les Deux Plateaux", more commonly referred to as the "Colonnes de Buren" ("Buren's Columns"), a 3,000 m² sculpture, 260 columns, created by Daniel Buren (a French conceptual artist) in 1986. This provoked an intense debate over the integration of contemporary art and historic buildings (the Palais Royal, completed in 1624, was originally home of Cardinal Richelieu). Sometimes classified as an abstract minimalist, Daniel Buren is known best for using regular, contrasting maxi stripes to integrate the visual surface and architectural space, notably historical, landmark architecture. 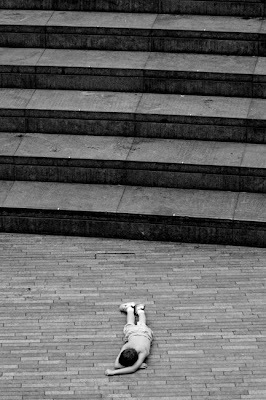 See also an interesting (full) press article from The Independant - by John Lichfield, from which you will find a few extracts : "[...] Two decades later, the columns have become popular as a slalom course for skateboarders and a minimalist climbing frame for children. They are beloved of tourists, who love to clamber on to the shorter stumps and have their photographs taken, posing as opera singers or politicians or sportsmen [...] But the giant, walk-in sculpture also originally a light show, a sound show and a fountain is no longer popular with the man who created it. Daniel Buren, 69, one of France's most internationally acclaimed modern artists, says he would like his best-known and most-visited achievement to be dismantled. "It is a work of art which has already been 50 per cent destroyed," he said. [...] The sculpture is officially called Les Deux Plateaux (The Two Levels). It has a subterranean section, covered by metal grilles, through which water is supposed to flow merrily, illuminated by floodlights, to reflect the columns above. Eight years ago, one of the floodlights came loose. It was shoved back into place with a lump of concrete. All of the other lights fused. They have never been repaired. Seven years ago, the running water packed up for reasons unknown. It has never been restored. 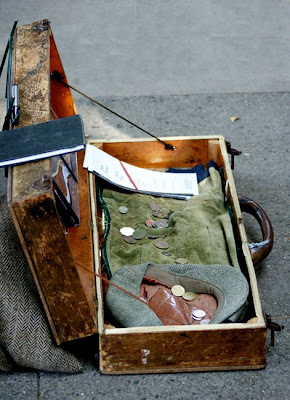 The underground sections of the sculpture have since filled up with rubbish and coins, cast hopefully by tourists into a non-functioning fountain. 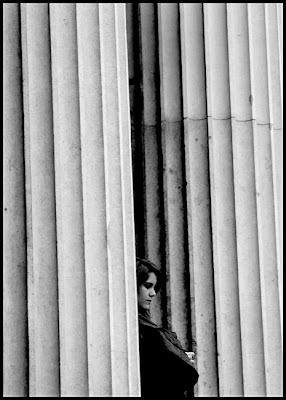 The columns had also begun to look grey and tatty. They have recently been polished, for only the second time in two decades. 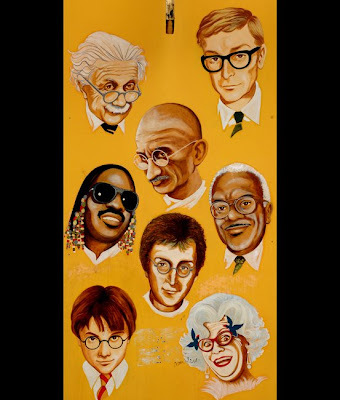 "Would they show only half a work of art in a museum?" Buren asks. 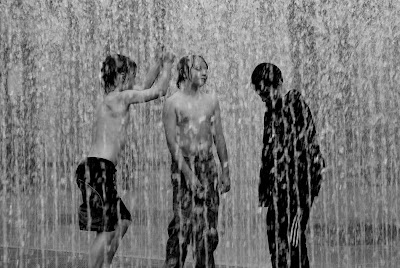 "No other fountain in Paris has been left like that, without water. Six months, I could have accepted, but for seven years? Frankly, any pavement in the capital is better maintained." [...] The Culture Ministry insists that it has money in its 2008 budget to restore light and running water to the Buren columns. The budget includes €14m for restoration of the Palais Royal, including €3.2m for restoration of Les Deux Plateaux. Buren says that he has heard all that before, from three previous culture ministers. Budgets were agreed; work was to begin; nothing happened [...]"
Just for the ones of you who wonder what was there before the Colonnes.... well it was a car park ! 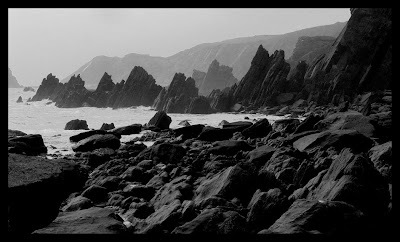 This photo was taken at Marloes Sands, Pembrokeshire, in Wales. It is within part of Pembrokeshire Coast National Park. Marloes Sands is an impressive geologically wonderous location, encompassing towering cliffs, a beautiful expanse of sand and clean sea water throughout the year. See also Marloes Sands Fossils to see more photos and know about the area. Marloes Sands beach is rated as one of the best beaches in Britain but involves a fairly long walk to reach it. 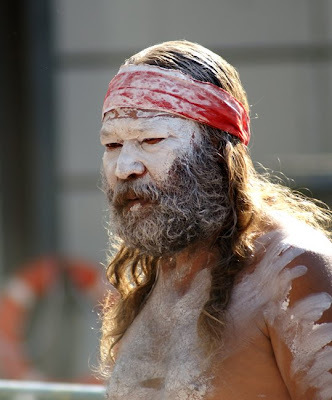 Australian Aborigines, Street Artist, Circular Quay, Sydney, Australia. 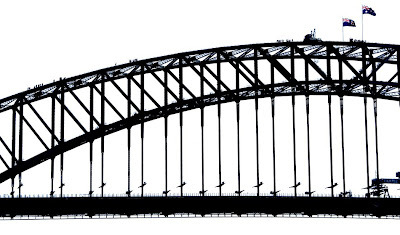 These two photos were taken in Sydney, Australia, and are showing Harbour Bridge, a steel arch bridge across Sydney Harbour that carries rail, vehicular and pedestrian traffic between the Sydney central business district (CBD) and the North Shore. The dramatic view of the bridge, the harbour, and the nearby Opera House is an iconic image of both Sydney and Australia. The bridge is locally nicknamed The Coathanger because of its arch-based design, although this usage is less prevalent than it once was. The bridge was designed and built by Dorman Long and Co Ltd and was the city's tallest structure until 1967. It is the world's widest long-span bridge and its tallest steel arch bridge, measuring 134 metres from top to water level. It is also the fourth-longest spanning-arch bridge in the world. 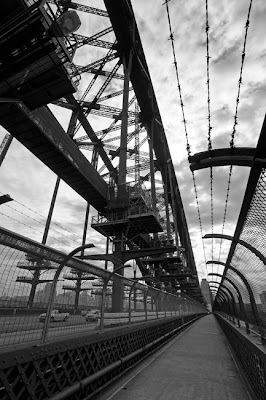 The south-east pylon served for many years as a lookout and tourist attraction for Sydney, containing a number of telescopes and antiquated arcade games which operated on pennies, long after that currency had gone out of circulation. The pylon has recently been renovated and returned to its tourist function. 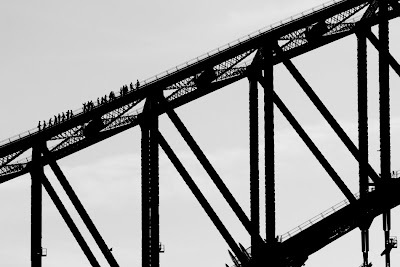 Since 1998, BridgeClimb has made it possible for tourists to climb the southern half of the bridge. Tours run throughout the day, from dawn to dusk, and are only cancelled for electrical storms or high wind. Night climbs are also available. Groups of climbers are provided with protective clothing appropriate to the prevailing weather conditions and are given an orientation briefing before climbing. During the climb, attendees are secured to the bridge by a wire lifeline. Each climb begins on the eastern side of the bridge and ascends to the top. At the summit, the group crosses to the western side of the arch for the descent. Each climb is a three-and-a-half-hour experience. 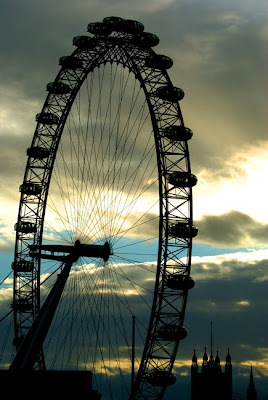 In December 2006, BridgeClimb launched an alternative to climbing the upper arches of the bridge. The Discovery Climb allows climbers to ascend the lower chord of the bridge and view its internal structure. From the apex of the lower chord, climbers ascend a massive staircase to a platform at the summit. 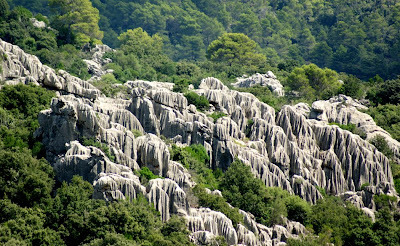 The cost for the climbing excursion is from $179 to $295 AUS and there are some restrictions in place. Visitors are not allowed to carry a camera or any other personal gear. Climbers are required to pass through a metal detector and take a breath-test for alcohol. 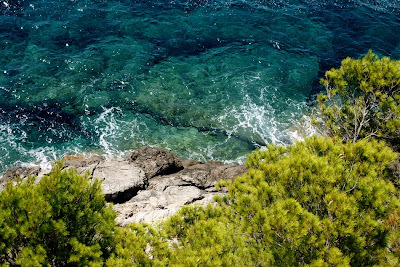 However, the authority in charge takes photos which are available to those who undertake the climb. All you want to know about the climb please visit the BridgeClimb website. 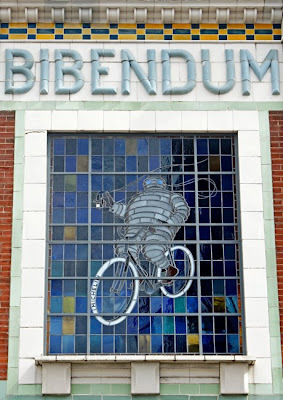 This photo was taken in London, 81 Fulham Road, on the facade of the Bibendum Restaurant. 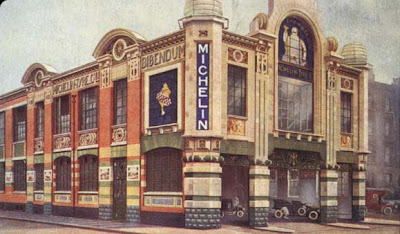 The Buidling (Michelin House), was commissioned by the Michelin Tyre Company Ltd as their first permanent British headquarters in 1909. 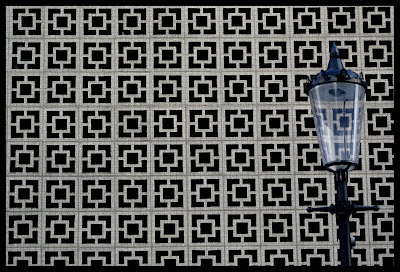 "Its exuberant stylistic individualism has been variously described as an example of Art Nouveau, proto-Art-Deco, Secessionist Functionalism and geometrical Classicism. It has even been described as 'the most completely French of any Edwardian building in London'! In 1985 Michelin moved out of the building and in June of that year it was bought by Sir Terence Conran and Paul Hamlyn. Planning permission for a restaurant, bar, major retail store and additional office space was obtained and a programme of extensive restoration of the building and reinstatement of many of its most prominent original features was begun." 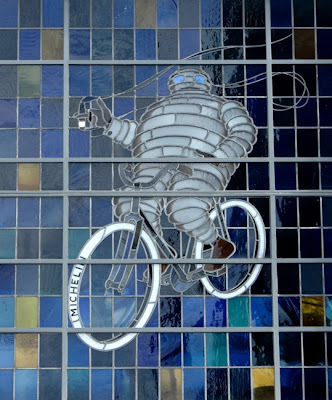 The Bibendum, (aka "Bib the Michelin Man", "Bibelobis", or simply the "Michelin Man"), is the symbol of the French company Michelin. 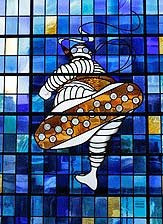 It was introduced in 1898, by French artist O'Galop (a pseudonym of Marius Rossillon), and is one of the world's oldest and most recognized trademarks, representing Michelin in over 150 countries. 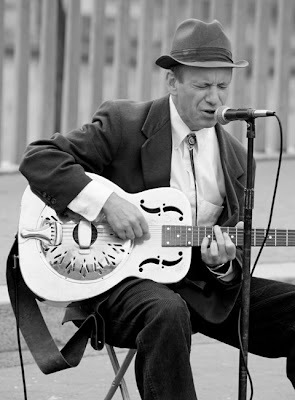 The second of a larger series, this photo was taken on the Île Saint-Louis in Paris, and showing René Miller's Wedding Band, with Johnathan Dickinson (drums), Chris Hudson (trombone), Tim Puckett (saxophone), Jeff Halam (double bass), René Miller (guitar, vocals). This is a photo of a Paris Métro or Métropolitain entrance, with Art Nouveau style. The name Hector Guimard is almost synonymous with Art nouveau in Paris. The first encounter of Art nouveau for many travelers takes place at the curvaceously flamboyant entrances to the Metro stations wrought in writhing green steel. The red lamps at the end of steel tendrils like orchid stalks announce rapid transportation to any corner of the city. 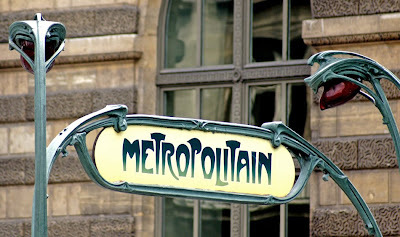 The sign "Metropolitain" in the Guimard-designed typeface at the entrances is now ensconced into the legend of the city, as undissociable as the Eiffel Tower and the Sacre Coeur, other Parisian institutions that almost never survived their epoch. See very interesting website Europa 1900 - The Art Nouveau Style. Of course the Paris Métro or Métropolitain is the rapid transit system in Paris. It is a symbol of the city, notable for its homogeneous architecture, influenced by Art Nouveau. It has 16 lines, mostly underground, and a total length of 214 km. 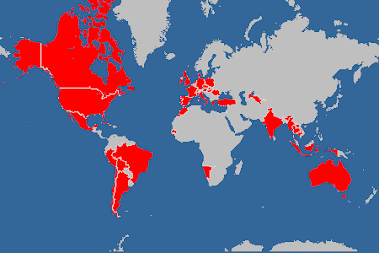 There are 300 stations. Since some are on more than one line, there are 384 stops. Paris has the most closely spaced subway stations in the world, with 245 stations within the 41 square kilometres City of Paris. Paris is the second busiest metro system in Europe after Moscow. It carries more than 4.5 million passengers a day and Châtelet - Les Halles is the world's largest underground station. The Métro is different from the RER (Réseau Express Régional, "Regional Express Network") which is another rapid transit system in France serving Paris and its suburbs.